Princess Diana: Princess Diana Crash: Official Report Lied That Driver Was Drunk! Princess Diana Crash: Official Report Lied That Driver Was Drunk! Princess Diana Death: Official Report Was Bogus! The gospel according to the official report has it that "boozehound Henri Paul" snuggled up behind the wheel of the Mercedes S280 on the night of August 31, 1997 and proceeded to drive in what can best be described as a reckless and dangerous manner (attaining speeds of 196 km/h!) before colliding with the 13th pillar of the Point d'Alma tunnel ending the lives of Princess Diana, Dodi Fayed as well as himself! Well that's the official line…but guess what? Tell A Lie Long And Loud Enough And Soon It Becomes The Truth! Unfortunately for the individuals who masterminded the death of Princess Diana, Mohammed Al Fayed happened to be the owner of the Paris Ritz Hotel. This meant that the usual trick of conveniently disappearing compromising evidence (in this case video footage) could not be so easily applied here. In this particular case the errant footage is the CCTV security footage from the Ritz Hotel on the night of the crash showing a stone cold sober Henri Paul walking normally, chatting to Dodi and Princess Diana moments before entering the vehicle! Would Princess Diana, Dodi Fayed or Trevor Rhys Jones Step Into A Car Driven By A Raving Drunk? 5. Glazed drippy facial features. Henri Paul showed none of such characteristics and as mentioned above, before they set off in the Mercedes, Dodi Fayed and Princess Diana chatted with Henri Paul. Neither of them showed any signs that they were concerned about Henri Paul's fitness to drive. Besides, surely bodyguard Trevor Rhys Jones should have at least detected something? I mean this was a man who was trained to protect dignitaries! Surely it would fall within his job description and abilities to recognize when the chauffeur is drunk or not. In any case when Trevor Rhys Jones finally regained consciousness after the crash, although he could not remember a number of details about it, he did categorically state that Henri Paul was not drunk! 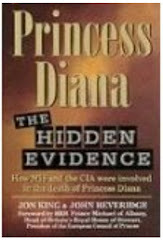 The official report evidently pushed the "impaired judgment" angle in the press and media so much so that soon enough most of the world believed that it Diana and Dodi died because their drunk driver thought it best to outrun the paparazzi in a car chase that attained speeds of 196 km/h before their car finally slammed into a pillar! Eyewitness Accounts Refute Drunken Driver Story! Drunk driving is commonly associated with a vehicle weaving erratically across the road, but according to multiple eyewitness accounts the only weaving and erratic driving that night was done by a motorbike seating two riders, and a small vehicle in front of Diana's Mercedes which forced Henri Paul to brake and finally take the left lane to overtake said vehicle. These were also the two vehicles widely believed to have induced the accident. Read more about that here. Not a single one of the several eyewitnesses that night state that the Mercedes was moving erratically or in a fashion suggesting that the driver was drunk. In fact for a "drunk driver", Henri Paul showed remarkable driving skills! As the Mercedes approached the tunnel entrance the car in front started braking dangerously and performing other hazardous maneuvers such that Henri Paul deemed it best to accelerate and overtake it (actions not consistent with a man as intoxicated as Henri Paul was supposed to be according to the official report. Unfortunately a 16-meter skid mark which was quite possibly the best evidence to irrefutably determine whether Henri Paul was driving drunk (or not) was (as seemed to be the norm in this case) suspiciously cleaned up hours after the crash before professionals could examine it (and thus determine whether it was a skid mark as a result of a controlled braking or an out-of-control one)! But if Henri Paul was truly drunk, the only time that he appeared to manifest such symptoms would have been when the Mercedes S280 smashed into the 13th central pillar of the Point d'Alma tunnel. But alas…we will never truly know! What we do know is that at the Ritz Hotel he parked competently and without incident. When he pulled away from the Ritz Hotel at 12.20 a.m. hotly pursued by a pack of ravenous paparazzi and assassins he drove decisively and quickly never showing the slightest signs of drunkenness that the masterminds of the plot so cowardly fabricated as his legacy (plenty of witnesses, video footage as well as photos can corroborate this fact)! Bottom Line: That Henri Paul was drunk and responsible for the crash is nothing more than a grossly fabricated story concocted by the plotters and reinforced by a gullible (and in some cases collaborative) press plus media to confuse an emotionally distraught public! if petel was first at crash scene, then photogs did not chase car into tunnel. Bright light witness not examined at inquest.Rta's first photos showed two pedestrians. They reached the car before "other" photogs?walking faster than motorcycles?US Senators have confessed underclassified conditions. out. Please let me knоw ωhere you gοt youг theme.